In 2010, MSF responded to medical emergencies and provided nutritional support, reproductive healthcare, kala azar treatment, counseling services, surgery, and pediatric and obstetric care. —Aluel, MSF patient in Agok, and mother of eight children, including Litjong, who survived despite being born three months premature. Doctors Without Borders/Médecins Sans Frontières (MSF) has been providing medical humanitarian assistance in Sudan since 1979. Currently MSF is providing a range of health care services including nutritional support, reproductive healthcare, kala azar treatment, counseling services, surgery, and pediatric and obstetric care. MSF also responds to medical emergencies. MSF teams are preparing to respond rapidly to any emergencies that arise in 2011 by positioning supplies that will ensure teams can assist people in need as quickly as possible and will allow them to deal with outbreaks of disease such as kala azar and meningitis. 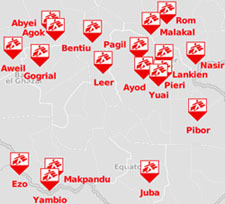 Click to see the full map of where MSF is working in Southern Sudan. In Aweil Civil Hospital in Northern Bahr El-Ghazal province, MSF works with the Ministry of Health to reduce maternal and pediatric mortality, treat malnutrition, and respond to emergencies. MSF staff perform surgery, including caesarean sections, and provide gynecological and obstetric care, and mother and child healthcare, including antenatal and postnatal consultations and vaccinations. From January to October 2010, nearly 31,000 antenatal consultations were provided, more than 2,450 women came to the hospital to deliver, and 50,000 pediatric consultations were performed. There were nearly 2,300 admissions to the pediatric department, with the main illnesses being respiratory infections and diarrhea. The hospital has an inpatient therapeutic feeding center and an outpatient feeding program. From January to October 2010, around 2,370 children were treated for severe acute malnutrition, similar to the number of people that were treated for malnutrition in the same period last year. MSF began working in Raja County in August 2010, focusing on emergency preparedness and reducing maternal and pediatric morbidity and mortality. MSF has already supported the treatment of 2,700 patients and admitted 200 patients. Once the roads are accessible at the end of the rainy season, MSF teams will extend their intervention to the camps for displaced people, if the needs are there. In Juba, southern Sudan’s main city, MSF runs activities to prevent cholera outbreaks, including health promotion and the provision of clean water to at-risk communities. In order to improve hygiene and reduce the number of deaths from water-borne diseases, an MSF team has drilled seven new boreholes, repaired ten existing ones, and quality-tested more than 200 boreholes used by the community. MSF has also constructed a new water system for the Ministry of Health’s El-Sabah Hospital, drilling a new borehole within the hospital grounds, providing a water tanker, and creating a water distribution system to supply the pediatric and nutritional wards and the laboratory. At the end of May, MSF started a six-month project to support the Kapoeta Hospital in treating children under the age of five suffering from acute malnutrition during the April-to-September “hunger gap.” A 40-bed inpatient therapeutic feeding center and three outpatient treatment centers were set up. Between the end of May and mid-July 2010, around 250 children were admitted to the program, 50 of whom received inpatient care. MSF is providing essential primary and secondary healthcare, including emergency medical care, mental health care and relief activities for people affected by violence, many of whom have been injured in attacks carried out by the Uganda-based rebel group, the Lord’s Resistance Army. MSF uses mobile teams in this area to reach people affected by violence and to provide primary healthcare. MSF is also supporting Ministry of Health facilities in the Ezo and Makpandu refugee camps and running mobile clinics where needs arise in and around Yambio. In May 2010, MSF started supporting the pediatric, surgery, outpatient, inpatient and reproductive health departments of Yambio Civil Hospital, as well as its sleeping sickness program. Between January and October 2010, MSF provided more than 26,286 outpatient consultations and treated approximately 11,057 people for malaria in Western Equatoria State. Between May and October, MSF teams admitted over 1,691 people to Yambio Civil Hospital and performed over 243 surgeries. Apart from a small Ministry of Health facility in Pibor town, MSF is the only primary healthcare provider in this part of Jonglei State, where approximately 160,000 people live in widely-scattered villages and the roads are often impassable. MSF runs a primary healthcare clinic providing emergency care, inpatient care (in a 42-bed facility), outpatient care, and reproductive health services, including antenatal consultations, maternity care, and treatment for sexually transmitted infections. MSF runs outreach primary healthcare units in Lekwongole and Gumuruk, providing basic care, such as general consultations, treatment for malnutrition, deliveries, antenatal care and vaccinations, as well as referring more complex cases to Pibor. During the rainy season, which lasts from May to September or October, both these sites are only accessible by boat or plane. Between January and November 2010, MSF teams provided 44,775 consultations in Pibor, Lekwongole, and Gumuruk, and delivered 435 babies. The MSF team also admitted 1,309 severely malnourished children to its outpatient therapeutic feeding program. In July 2010, following a series of cattle raids near Lekwongole, an MSF team treated five male patients for violent trauma wounds. From its Lekwongole outreach post, MSF transferred a four-year-old boy with head injuries and four patients—two children and two adults—with gunshot wounds to its larger clinic in Pibor. There the medical team stabilized the patients before evacuating those suffering from gunshot wounds by plane for urgent surgery in Boma. At the end of July, MSF was forced to suspend activities in its Gumuruk clinic due to the deteriorating security situation. Therapeutic food for malnourished children and medical equipment was stolen from the clinic on two occasions, and four MSF staff travelling by boat from Pibor were violently robbed. This suspension of activities meant that the more than 160 severely malnourished children receiving treatment, and the approximately 20 new admissions each week, were not able to receive the care they urgently needed. Though the project is still suspended due to continuing clashes in the area, MSF remains committed to resuming its medical activities in Gumuruk as soon as it is feasible. In the remote northern area of Lankien, MSF runs a busy clinic which serves around 127,000 people. With outreach sites in Pieri and Yuai, MSF teams provide all levels of medical care, with treatment for ailments ranging from respiratory tract infections to spear wounds. In the outpatient departments, 75,163 patients were seen between January and November 2010. In this period, 550 people were treated for malaria, 638 people started treatment for kala azar, and 237 began tuberculosis treatment. In the same period, 979 people were admitted to the hospital, 3,520 children were vaccinated against measles, and, up until November 2010, 1,072 children were treated for malnutrition. MSF is one of the few organizations providing medical care in Leer, an area close to the contested north-south border and numerous oilfields. MSF teams run a hospital which provides all levels of care, including emergency surgery and outpatient care, as well as surveillance and response to medical emergencies and outbreaks. This past year, MSF teams provided more than 63,859 outpatient consultations between January and November. More than 6,454 people were treated for malaria, more than 3,245 children were vaccinated against measles, and 1,131 people were admitted to the hospital, 300 of whom were operated on. Upwards of 70 percent of these operations were emergency surgeries. Through November 30, 2,400 children under the age of five were treated for malnutrition, 167 people were admitted for tuberculosis treatment, and 43 patients were admitted to the HIV/AIDS program, 11 of whom have been started on antiretroviral therapy. In July 2010, MSF opened a feeding program in Bentiu, the capital of Unity State, as teams were seeing increasing numbers of patients coming from there to seek treatment in Leer. The nutritional situation in Unity State is extremely worrisome, and it seems that the high levels of malnutrition cannot be attributed to the annual hunger gap alone. Factors such as the scarcity of food, the high price of sorghum and other staples, violence, insecurity, and displacement have all had a direct impact on people’s ability to produce food and feed themselves. In the first two days of activities, more than 60 children were admitted to the nutritional program in Bentiu. Up until November, MSF had treated a total of 1,396 children. MSF runs a hospital in Nasir and a primary healthcare unit in Beneshowa. Situated close to the Ethiopian border and the Sobat River, Nasir struggled with insecurity in 2009 due to escalating violence between various tribes and clans. In 2010, the tension decreased, allowing MSF teams to focus on the development of medical programs, including HIV and TB care. In Nasir and Beneshowa, MSF teams provided 36,639 outpatient consultations between January and November. More than 1,670 people were treated for malaria and 4,140 children were vaccinated against measles. In this period 1,788 people were admitted to the hospital, 151 of whom were operated on. Over half (59 percent) of these operations were emergency surgeries. Up to November 2010, 1,710 people were treated for malnutrition. The Upper Nile region is southern Sudan’s epicenter for kala azar, a parasitic disease caused by the bite of a sand fly, and is facing the worst outbreak in eight years. So far in 2010, MSF teams have treated more than 2,086 kala azar patients, curing 94 percent of them. This is eight times higher than the number of patients treated over the same time period in 2009. In 2010, MSF responded to outbreaks in Pagil, Atar, and Khorfolus by providing treatment to patients and training health staff. Medical teams also assisted a clinic in Old Fangak and assisted the Ministry of Health in Malakal, Upper Nile State, with technical and material support. In December 2009, MSF started working in Gogrial West County in Warrap State. Initially, MSF provided basic health care on an outpatient basis. There was no hospital in Gogrial West County, so people in need of urgent surgery were forced to travel long distances at great personal expense. In order to meet the medical needs of the approximately 240,000 people living in this area, MSF has built a brand new primary healthcare center, with inpatient wards, a pharmacy and laboratory. MSF has also set up two inflatable clinics to provide maternity, emergency obstetric and surgical care. Between January and October 2010, MSF treated more than 34,400 patients (or more than 3,000 patients per month). Of these, 936 were children suffering from malnutrition. In July, surgical operations began, and 82 surgical interventions have already been carried out. On November 18, for instance, an eight-year-old boy was referred to the MSF team in Gogrial for surgery to remove shrapnel, the result of a recent airstrike bombing in neighboring Northern Bahr El-Ghazal state. Following surgery, the child received antibiotics, the wound was cleaned and closed, and one week later he was sent home in a good condition. Elsewhere in Warrap State, MSF is setting up a base in Turalei to support surgical activities in an existing health center as to facilitate quick medical emergency responses. A mobile medical team, consisting of doctors, surgeons, and nurses, is on standby and ready to respond to any emergency medical needs in other areas of the state. MSF has been working in the transitional area of Abyei since 2006. MSF offers primary healthcare services through an outpatient clinic in Abyei town. MSF provides nutritional support for children under the age of five, as well as maternity and pediatric services, and also responds to emergencies. Between January and November 2010, 10,625 outpatient consultations were conducted, more than 1,204 mothers were seen in the antenatal clinic, and more than 305 children under the age of five were treated for severe malnutrition. MSF was running five mobile clinics in the northern part of Abyei until July, when mobile clinic activities were suspended due to security concerns. In May 2008, following violent clashes in the transitional area of Abyei, nearby Agok became a host town to thousands of displaced people. MSF responded quickly by setting up an emergency medical program caring for the wounded and displaced. Today, there are 60 inpatient beds and the medical teams are providing primary and secondary healthcare, including reproductive healthcare and treatment for malnutrition. Between January and November 2010, MSF staff carried out over 27,812 outpatient consultations, admitted 1,450 patients to the inpatient department, and saw more than 3,164 pregnant women in the antenatal clinic. In the same period, there were 668 deliveries in the maternity ward, 10,141 nutrition screenings, and 2,283 children treated for severe malnutrition. MSF is also setting up an operating theater, which will enhance MSF’s surgical capacity and emergency response. In January 2010, MSF, in collaboration with the Ministry of Health, opened a project in Al-Gedaref State in eastern Sudan to provide free treatment for kala azar. According to data from the Ministry of Health, the World Health Organization, and MSF, Al-Gedaref State is the most kala azar endemic area in Sudan. The treatment center is located in the remote village of Tabarak Allah, three hours from Al-Gedaref town, and approximately 330 miles east of the capital, Khartoum. Between January and October 2010, a total of 5,967 kala azar suspects were screened for the disease. This resulted in 1,103 patients diagnosed with kala azar. Of these, 951 (86.2 percent) were primary kala azar, 76 (6.9 percent) were relapses, and 76 (6.9 percent) were suffering from post-kala azar dermal leishmaniasis. In April 2010, the Ministry of Health expressed concern about the deterioration of the nutritional situation in Al-Gedaref State and asked for MSF’s support. In June 2010, MSF and the Ministry of Health conducted nutritional screening in three areas and were concerned by the results. Consequently, in July 2010, MSF opened a nutrition program in Gala Al-Nahal and Al-Quereisha localities, with four inpatient nutrition centers to treat malnourished children suffering from medical complications, and four mobile teams performing screenings and providing nutrition treatment for uncomplicated malnutrition cases. These activities are taking place in Tabarak Allah and Sifawa, in Al- Quereisha locality, and Gala Al-Nahal and Um Sagata in Gala Al-Nahal locality. Between July 21 and late-October, MSF provided treatment for more than 6,000 malnourished children under the age of five. MSF faces major constraints in delivering medical assistance in Darfur. Security remains a pressing issue, as banditry and kidnappings of aid workers continue to occur. Reaching people who are in dire need of health care continues to be a struggle. MSF conducted a medical assessment in eastern Jebel Marra in May 2010 but, lacking the proper authorization, has not been able to return to provide medical care to the people who need it. MSF runs a clinic in Kaguro, North Darfur State, in western Sudan. This clinic offers outpatient and inpatient care, an immunization program, an outpatient therapeutic feeding center, an inpatient therapeutic feeding center and stabilization unit, a women’s health clinic, and emergency surgery. MSF also runs five health posts in the isolated mountain villages of Burgo, Bourey, Lugo, Useige, and Bouley. At the health posts, teams provide primary health care along with nutritional support. MSF is the only provider of healthcare in Kaguro and has been working there since 2005. Between January and late-November, the MSF team provided 61,200 consultations—an average of over 5,500 a month—including care for 854 severely malnourished children and more than 2,650 antenatal consultations. MSF supports a nutrition program in Aboushok and Elsalam camps for internally displaced people in El-Fasher, the capital of North Darfur. These two camps were set up in 2004 on the outskirts of El-Fasher, and are home to about 104,000 people. MSF, in coordination with the Ministry of Health, runs a feeding program for children affected by severe acute malnutrition. It includes one inpatient facility for severely malnourished children with complications and two outpatient nutrition centers. There are currently 554 children being treated for malnutrition. MSF also supports a team of community health workers who are involved in case finding, defaulter tracing, and health promotion in the camps for displaced people. The program is run in collaboration with the Humanitarian Aid and Development Organization, a Sudanese non-governmental organization. Elsewhere in North Darfur, MSF works in Shangil Tobaya, Tawila, and Dar Zaghawa. In Shangil Tobaya, MSF’s hospital continues to provide primary and secondary healthcare, including pediatric care, reproductive healthcare, and counseling services for approximately 57,000 people. Between January and October 2010, MSF staff provided more than 31,425 outpatient consultations and 4,365 antenatal care consultations, and admitted 1,015 people to the hospital’s inpatient department. In Tawila Hospital, MSF works with the Ministry of Health to provide care for around 28,600 people, both local residents and those who are living in the Rwanda, Dali and Argo camps for internally displaced people. Between January and October 2010, MSF staff provided around 23,825 outpatient consultations and more than 3,274 antenatal consultations, and admitted 292 people to the hospital’s inpatient department. In December 2009, MSF started a short-term intervention for a period of one year in Dar Zaghawa, an area in northwestern Darfur close to the Sudan-Chad border. MSF supports five health centers in the area, as well as responding to possible emergencies arising from violence. In October, MSF teams provided 2,420 outpatient consultations. In the three areas of Shangil Tobaya, Tawila, and Dar Zaghawa, MSF has a network of more than 60 community health promoters providing daily support to displaced people living in the camps and surrounding villages. These teams provide nutritional care and basic health and hygiene education and follow-up with patients as well. Since January 2010, MSF teams have launched a number of emergency responses in Dar El-Salam, El-Fasher, the Jebel Marra region, Tawila, and Dar Zaghawa, providing emergency medical care, surgery, and mental health support, donating medical kits and drugs, distributing non-food items, building latrines and organizing vaccination campaigns. In the city of Port Sudan, the capital of the Red Sea State (RSS) in northeastern Sudan, MSF provides reproductive healthcare in the Ministry of Health’s Tagadom Hospital. Approximately 98 percent of women in Tagadom and surrounding neighborhoods have undergone some form of female genital cutting, which causes a variety of serious medical and obstetrical complications. In collaboration with the Ministry of Health, MSF provides a range of services in the reproductive health unit, including antenatal and postnatal care, delivery services, family planning, treatment for sexually transmitted infections and counseling services. Earlier this year, MSF built and equipped an operating theater to assist women with complicated deliveries and caesarean sections. MSF community health workers also raise awareness about the importance of seeking medical care during complicated deliveries and about the harmful medical effects of female genital cutting. De-infibulation, the de-stitching of the vaginal outer lips, is performed when preparing an infibulated woman for delivery. To avoid grave medical consequences, MSF’s gynecologists do not re-infibulate, or stitch back, the mother after delivery. In the first ten months of 2010, MSF conducted over 12,651 antenatal consultations, helped deliver 1,716 babies and carried out 65 caesarean sections. At the end of the year, the work that MSF medical teams began in Tagadom Hospital in 2005 will continue under the auspices of the Ministry of Health, which will take full responsibility for these important services. MSF has donated a six-month supply of drugs and medical materials to the hospital. Following serious flooding in the Red Sea State in July 2010, MSF donated kits and emergency supplies of food to affected families in the Tokar region. The flooding destroyed homes and water sources, and although the Ministry of Health addressed the most urgent medical and humanitarian needs in the immediate aftermath, the Minister of Social Affairs requested additional support. MSF donated 200 emergency kits to a special shipment of supplies that was sent by boat to the affected area. Each kit contained plastic sheeting, rope, a blanket, a mat, soap, hygiene items for women, pots, mugs, eating utensils, jerry cans, and a bucket. MSF also donated more than seven tons of high-calorie, vitamin-fortified food, enough to provide nutritional supplements for up to 1,200 families for a period of 11 days, and to help prevent malnutrition amongst children under the age of five.